Years ago deworming meant stress for me and my first pony. Sholto was not really hard to deworm, but I had to be cautious. He could move his head down in a split second and sometimes that meant that I pinched the syringe in his palate. Or, I emptied the syringe while he was moving his head sideways and all the dewormer paste squirted in the air because the syringe was sticking out of his mouth on the other end. When I started using clicker training my mind was focused on teaching Sholto tricks. It never crossed my mind to use clicker training to teach my horse things like ‘happily accepting a deworming treatment’. 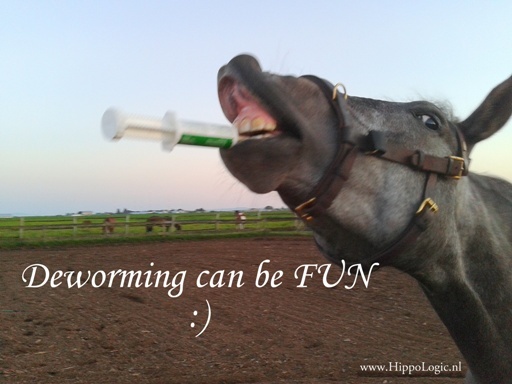 For the World Equine Clicker Games 2013 I made a video about easy deworming with my current horse Kyra. Kyra had already mastered the key lesson ‘targeting’. So she knows that touching an object on my cue is rewarded. I started using a cleaned old dewormer syringe as a target. Session 1: touch the syringe. Some horses have very negative associations with dewormers and for those horses ‘looking at the syringe’ could be the first step. Session 2: In order to empty a dewormer in a horses mouth, you have to empty it at the back of their tongue. The easiest way to enter their mouth is in the corner, where they have no teeth. The horse must accept the syringe touching the corner of his mouth. When Kyra accepted the syringe against a corner of her mouth, it was time to take the third step in this training process. Putting the syringe in her mouth. I use the verbal cue ‘open’. I always let Kyra come to the syringe to test if she doesn’t think the syringe is an aversive. Step 5 is getting the horse to swallow the paste. Often the paste is a surprise to the horse, so you can train your horse to be ready for it. I tested first if Kyra would like applesauce. She wasn’t crazy for it, but she ate it. Good enough for session 4: accepting a substance out of the syringe. I use a cue word to warn Kyra ‘something is coming’. I don’t want to surprise her with something with a bad taste. The sixth step of this process was the real dewormer. Because a lot of rewards were involved in this training, Kyra doesn’t have negative associations with the deworming syriche. The syringe is now associated with good things (clicks and rewards). I never expected that it would become this easy. Now I can deworm Kyra without a halter and without any stress. Every time before I deworm Kyra I start with a short reminder session with a few clicks and rewards. Of course you can also try to put the dewormer paste in a sandwich and just feed it to your horse. I’ve seen that working with some horses, too.